This application calculates the geographic and horizontal coordinates of artificial satellites. Geographic position must be supplied by geolocalization services or manually. Since the calculations are done in real time, device clock synchronization is important. 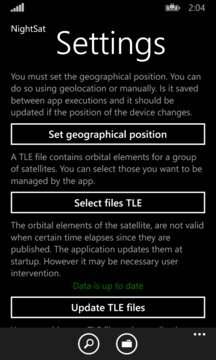 Orbital elements updates are managed by the app. Satellites are classified in groups ( visibles, geostationary, communications, navigation, etc. . ). Within each group you can filter the satellites above the horizon at a given time, and also , those who comply with that condition and are iluminated by sunlight. The latter are called "visibles" in the application and can be observed if they are sufficiently bright. 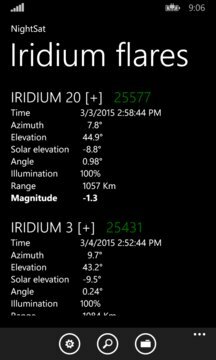 Within the Iridium group, you can predict flares. The best hours for observation are just after dusk or just before has it starts to dawn. You can also access a specific satellite either by its name or NORAD number. Once selected, coordinates and its position on a map are showed in real time. If you have a compass and accelerometer , the application can help you to locate the satellite. The application can search for the passes of the satellite above the horizon that will occur in the coming days.